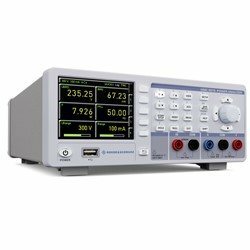 Premium power analyzer with a power range from 50 μW to 12 kW, an analogue bandwidth from DC up to 100 kHz and a sampling rate of 500 ksample/s. Premium power analyzer with a power range from 50 μW to 12 kW, an analogue bandwidth from DC up to 100 kHz and a sampling rate of 500 ksample/s. Including EEA-488 (GPIB).